The 400-metre zip-line over the Chay River to the entrance of Toi Cave (Dark Cave) in the central province of Quang Binh was recognised by the Viet Nam Book of Records (Vietkings) as the longest zip-line route in Viet Nam. The zip-line system is a classic choice for those who love adventurous activities. Phan Thanh Nien, a mountaineer who successfully conquered Everest Mount in Nepal, said that Chay River-Dark Cave zip-line system will be an attractive destination for tourists given its stunning terrain. The modern zip-line system has been operational since September 2014, drawing about 30,000 travellers, most of whom are foreigners. 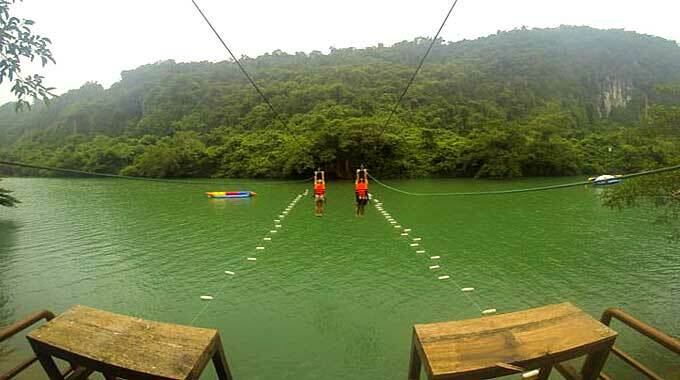 Zip liners will be dazzled by the gorgeous views from the air, seeing a large part of Chay river and the jungle snaking between mountains or even dipping themselves to the crystal green water.